Reviewer Profile – Kay V.
I grew up on a farm 10 miles from Woodbine, in southwest Iowa during a time of not-so-plenty. I still have the first book I “memoread”: Dale Evans and Buttermilk. It was a Telltale book, published by Whitman in 1956. Our mother used to make the weekly trip into town with cream and eggs to trade for groceries and machinery parts. When she returned, there was usually a box of public library books in the trunk. I could hardly wait until everything had been toted into the house so Mom would step back to the trunk and turn the key to a treasure we could keep for two weeks! I have been an active reader throughout my life, influenced by my bedtime-story-reading mother and the country school teachers who read aloud after the “noon” recesses. The classic, Black Beauty, took a big grip on me, as well as Little Women. Then there was Millions of Cats by Wanda Gag, Lenski’s Houseboat Girl, the d’Aulaire’s Abraham Lincoln, The Door in the Wall by de Angeli, Farley’s Black Stallion books, and the Red books by Kjelgaard. Poetry also captivated me, as I was especially fond of Rose Fyleman’s “Mice” (I think mice are rather nice . . . .) and Sandburg’s poetry. I remember my older schoolmates playing the card game, “Authors,” during bad-weather recesses and thinking Whitman looked rather Santa Clausy while Stevenson seemed sinister. As a much older reader, I have been rather taken with the nonfiction work of Julia Cameron (The Artist’s Way series, etc. ), the young adult fiction of Richard Peck, and have quite enjoyed recommended reading by both staff and patrons, including the One Book One Lincoln selections. I would not have envisioned myself actually working in a library when I was eagerly pulling the books from that box in that dusty car trunk all those years ago. Currently, the bulk of my reading is at the youth level for readers’ advisory purposes as well as storytime. Author Mo Willems stays near the top of my storytime favorites, as well as Keiko Kasza, Chris Raschka, Gerstein, Yolen, Lewin, Bunting–. Stop me! Reading new books, Golden Sower nominees and other award winners is also a goal. 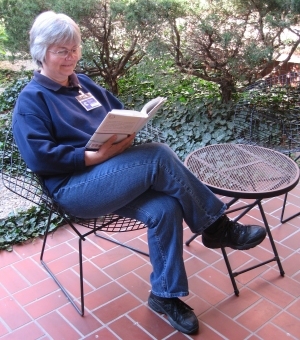 Youth Services staff have a certain amount of assigned reading, so that always comes first. But I also rely on the person-to-person reviews I get from friends, relatives and library staff. My daughter, who lives in NYC, is in the Metro book club. A book company sends out books to readers to review before the books are released. She sent me her copy of The Guernsey Literary and Potato Peel Pie Society. I have not yet read her full review, but I am eager to compare it to the short one I wrote for BookGuide! I just love to share a great story! I am torn between two. (Sorry!) If you are in need of some Aha! nonfiction moments, go with Julia Cameron. If you need to abandon yourself to some laugh-out-loud wit, Mo Willems is your fiction author/illustrator. The pigeon is not just for kids!